#stillshot is a feature in which someone selects a frame from a film, TV series or promotional campaign and discusses its content. The idea being to spark conversation on the art of film composition, which is so often reflective of the movements of its time. Also, ‘cause there’s some pretty cool film shots out there. We have here the superimposed assembly of four red-carpeted celebrities. This isn’t unusual – except that not one of them is white. Shall we throw in that mildly toxic phrase ‘positive discrimination’? The likelihood of exhibiting four British famous people (at least, at random) without one Caucasian thrown into the mix is extremely low. ‘Positive discrimination’. Seems like an oxymoron, huh? An odd pairing of words that was avoided like the plague by The Guardian on Saturday, and indeed the other papers I read up on. And it makes perfect, fair and rational sense that, by rights, the person who is best for the job should get the job. But Tony Hall, Director-General of the BBC, endorsed positive discrimination this week – along with what has been called the ‘vanguard’ (see above photo) for the BBC’s new and lengthy project – when he promised that within the next three years, the number of minority ethnic BBC employees on television will have risen by over forty per cent. That’s just those who will be on air. 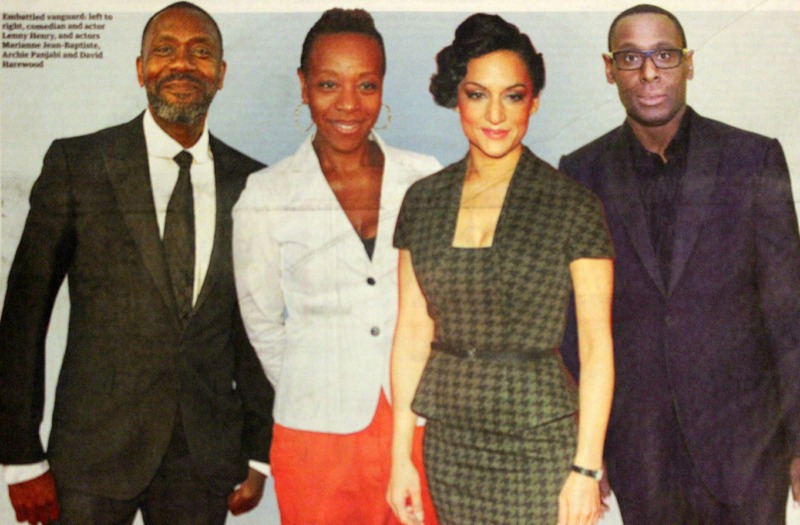 With statistical precision, targets have been set for the increase of black, Asian and minority ethnic young people and senior-level BBC staff leading up to 2020. This wasn’t headline news. A minority report, pardon the pun, pressurised by Lenny Henry, comedian extraordinaire and long-time Premier Inn promoter, lest we forget, and who is – you’ve guessed it – obviously, unchangeably, an ethnic minority. And despite all the news bulletins edging around the words ‘positive discrimination’, there’s equally no hiding this new programme from the fact that this is what it is. Ugh, what a heavy topic. It needs a conversation, rather than a one-way, one-thousand word article. It needs a book, an autobiography. I can never hope to do it justice, or say it quite right. Help. To guide us through the angry, myopic jungle of the (oxy)moronic phrase ‘positive discrimination’, can I tell a little story? I remember it distinctly: the point at which we were crossing the road in our queue of pairs, during the trip to the big school we would soon join for Yr3, when Holly called my dad a black man. ‘You know your dad’s black …?’ It was the first half of a question: the factual statement before the clause. She never got to finish. I didn’t want her to call my dad ‘black’. My seven-year-old self associated that word with a ‘bad’ feeling. I didn’t understand what, specifically, or why, or why it mattered. But I had read and seen and watched and heard what I had come to understand of the description ‘black’, the outward colour of a person, as being largely synonymous with ‘bad’ – variants of ugly, suspicious, poor, potentially criminal. I can hear your questions, but I don’t recall any specific references on TV, in books, in conversation prior to that moment which may have caused me to draw this conclusion; could not then, cannot now. In hindsight we can view again on YouTube those blurry images of Brixton riots, starving Africa and gollywog caricatures if we want to speculate…the point remains: as a seven-year-old child, this is what I understood. Race was far from a taboo subject in my family, my home, my immediate circle of friends. I was confident about my colour, my hair, the habits, experiences, palates I had collected from my time in Jamaica and the fantastical stories of my heritage. Maybe it was simply that the word ‘black’ was not thrown around enough within my household, the street that I lived in, the school that I went to, as everyday vocabulary to mean something powerful, celebrated, steeped in a rich history of diversity and resilience. So the word ‘black’, to me, was the dark, hooded youth on news reports, described as such in the clipped tones of the presenter; it was the tragedy of Stephen Lawrence who always had ‘hate’ and ‘crime’ attached to his name; and mass collectives of ghetto-ed faces peering out of Detroit, out of gun-toting New York slums, out of the Western idea of Africa, poor and hungry and far removed. I’m talking, of course, about the difference it is so hard to fathom as a child, between the individual, everyday people we love and experience, and society’s entrenched collective psychology which lumps these people together based on appearances, class, gender, to make it quicker and easier to judge them. The individual versus the stereotype. To the contrary, when I looked at my dad, I saw a tall, strong, dark brown man. Not dangerous. Not poor (for this, in itself, had also impressed upon me as a weakness of character earned by being heard as a vague, condemning term). I thought that by calling him ‘brown’, by stamping my feet in the middle of the road at Holly and swarming teachers and demanding they call him the same, I could dismiss his affiliation to criminality or victimhood, neither of which seemed synonymous with my idea of him at all. Alas, my outrage precipitated no such thing, and I was forced to suffer the excruciating, stomach-churning embarrassment of ‘being wrong’, an awful affliction I had come to dread in cold sweat during my haughty single-digits. (Indeed, many of my acquaintances, and siblings in particular, may argue there is yet to be a watershed moment in my allergy to this state of being.) My dad was black. It was a fact, a statement, unchangeable. Let’s be clear, here: when you’re a child the images you see on television are not linked to social theory, or cultural discourse, or history. They are objective, they are simply the truth of things, little people living in a box who reflect like a mirror the bigger, outside world. Mufasa and Scar are as real as Blair and Bush – perhaps even more so. And so it is imperative that there is a balance to what we see on our screens at a young age, in the hope that this may reduce bias. And if that takes a conscious effort, with targets and statistics that try to align the representation of faces on our screens with the ratios, the characters, the people we see day-to-day within our actual population, then so be it. Needless to say, I no longer have any qualms about the nomenclature of the race to which my dad and I myself belong – indeed, I interchange said word with ‘mixed-race’ accordingly, but that warrants a whole other story. It has been thirteen years since this example of my primary and simplistic understanding of our society’s entrenched racial stereotypes took place, but in half that time, as of 2006, the number of minority ethnic people working within UK TV has dropped by thirty-one per cent. In order to dispel the negative, we must promote the ‘positive’. It’s imperative, when so much right-wing nationalism and anti-immigration – which, in truth, is anti-Third World immigration – is coursing through the media, that the demographic of our population which is not violent, criminal, extremist, unattractive, but still an ethnic minority, is represented to combat the shady, pixelated pictures of black faces on police reports, or Daily Mail front-cover snapshots of ‘swarms’ of British Jihadists. The story I have told resulted henceforth in what was arguably a far more profound and memorable event (my mother may even attribute a capital ‘E’ to this word): that of my silence, as I tried not to cry in the school yard about how unfair and confusing I found it all. At the time, in memory an age, but let’s face it, more likely a week, I avoided engaging in conversations about race (a topic as volatile and equally important to me at the time as that of the tuna mayonnaise my mum was putting in my sandwiches, leading to comments by certain classmates that my schoolbag stank of fish). But, needless to say, said conversations went on in front of me without my contribution and in ignorance of my muteness. Silence and passivity – allowing actions to take their own course – doesn’t work, and to an extent I learnt this as a seven-year-old. Thus, I endorse the BBC’s pro-actions as ‘positive’, appreciate that not everyone may feel the same, but hope, regardless, that to move out of a zone of silence and passivity within the realm of television will not be viewed by some as a new sort of ‘discrimination’. We’re talking, instead, about breaking down the habit of widespread and harmful stereotyping, which has surely been a thing far more unfair, irrational and moronic than any project promoting equality on television. I read this article and found it very interesting, thought it might be something for you. The article is called ‘Positive Discrimination’ and the BBC – #stillshot and is located at http://prancingthroughlife.com/2014/06/26/positive-discrimination-and-the-bbc/.